LARGE: Sheet size: 24.4" x 26.8", design is 21.4" x 22.8"
MEDIUM: Sheet size: 18.8" x 20.8", design is 15.8" x 16.8"
SMALL: Sheet size: 12.8" x 14.4", design is 9.8" x 10.4"
Our Piazza Chalkboard Stencil makes a fantastic frame for your chalkboard. Your "to do" list never looked better. This Piazza Chalkboard paint stencil is designed to work with chalkboard paint. Benjamin Moore Chalkboard Paint now comes in any color, which gives you unlimited decorating options! Our chalkboard paint stencils are great for office & kitchen use - you can easily create chalkboard shapes that are great for notes and reminders, making lists, leaving messages and inspiring quotes or just doodling! These stencils will surely inspire creativity and are perfect for kids rooms and playrooms! 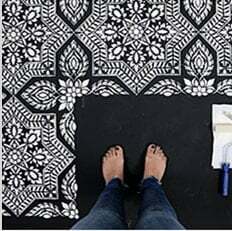 You can also use this stencil design as an allover pattern using regular wall paint, and even for various craft projects "“ it's so versatile! Here are some tips on working with chalkboard paint and our stencils: These stencils will work best on smooth walls without texture. For crisp edges, a spray adhesive can be used to minimize possible paint bleed. Lightly mist the stencil with spray adhesive, let it dry for a few seconds and then position the stencil on the wall. Using a dense foam roller, apply chalkboard paint by rolling it over the stencil. Avoid over-loading your roller with too much paint, and try to roll from the outside of the design inwards. After you applied 1 coat of paint, let it dry for a few minutes and then apply another coat. This will give you great coverage. Remove the stencil and let the shape dry completely before writing on it with chalk.